Hello all! I am Virginia, an embroidery enthusiast and an educator for Dakota Collectibles. I love creating things with embroidery and thought it would be fun to share my projects and ideas with others, so I am entering the world of blogging. I use Dakota Collectibles' designs for my projects. Dakota Collectibles design collections can be found on Ann the Gran's site here . This is my first blog with Ann the Gran, so please let me know what you think about what I have shared here. Halloween will be here before we know it. 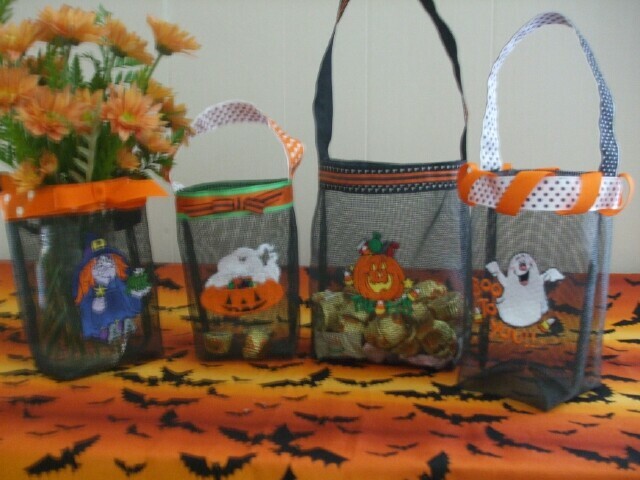 One of my favorite projects is trick or treat bags made from vinyl replacement screen that you use for windows or doors. It is available at most big box hardware stores and also at some Wal Marts. You can purchase it in large amounts or small amounts or sometimes by the yard. Be sure you get the vinyl and not the real wire screen. Halloween embroidery designs. (Mine were from Dakota Collectibles packs Halloween #970206 and Glow in the Dark Pack #970313) . Bags can be made in any size. For the largest one in the picture above, you need the screen cut 22” h x 11” w. Measure down from top 8 inches. Draw a horizontal line with my favorite marking tool (leftover slivers of soap from the shower). This line will be the bottom edge of the bag. To center the design, make another horizontal line half of that distance – 4 inches. 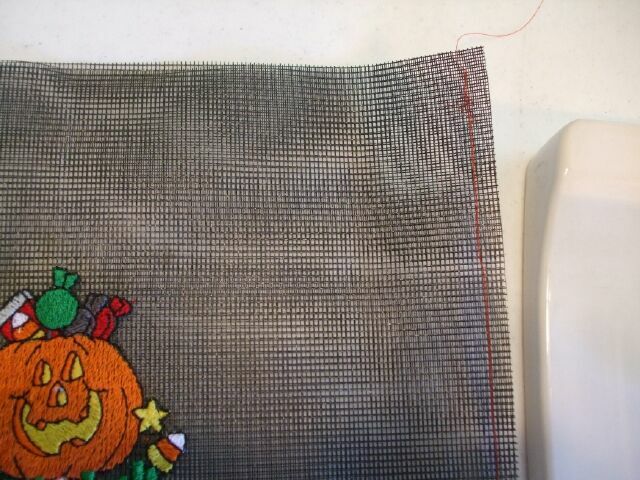 Then mark the center of the width of the bag with a vertical line - 5 ½ inches. This will give you the center mark for your embroidery design. Hoop the black tear away stabilizer only and pin the marked screen to the stabilizer, lining up the markings with the center notches on your hoop. 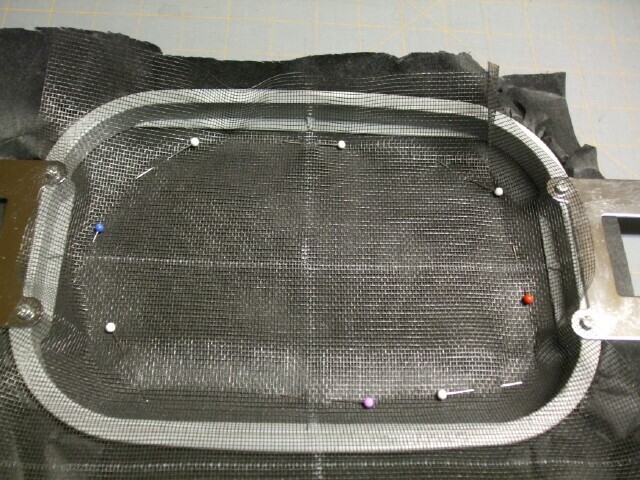 Be sure the pins are well outside the embroidery design area. 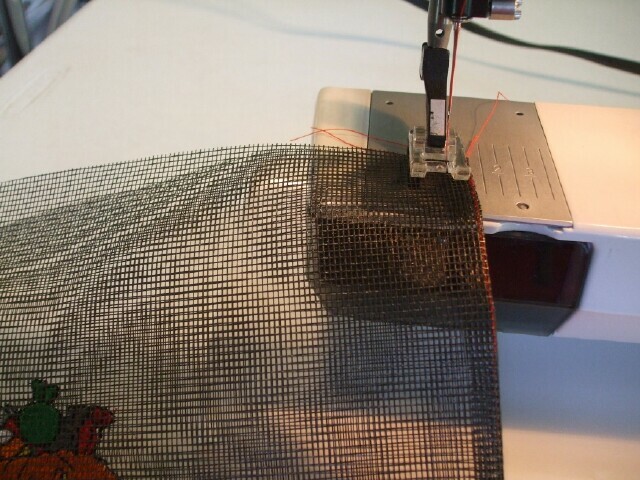 Embroider the design, remove from the hoop and tear away the stabilizer. The side seams of the bag are sewn next. I use a French seam as it helps to strengthen the sides of the bag and a little one will not be stuck with the “pokies” on the sides of the screen. It will not actually stick into their fingers, but might give them a little sticking sensation. If you have forgotten high school home ec classes, to make a French seam fold the bag with WRONG sides together and sew a quarter inch seam down both sides. Then turn the bag wrong side out, finger press the seams and sew another seam down the sides just wide enough to encase the previous seam. Leave the bag wrong side out and fold it with the side seam down the center of the side of the bag forming a triangle. 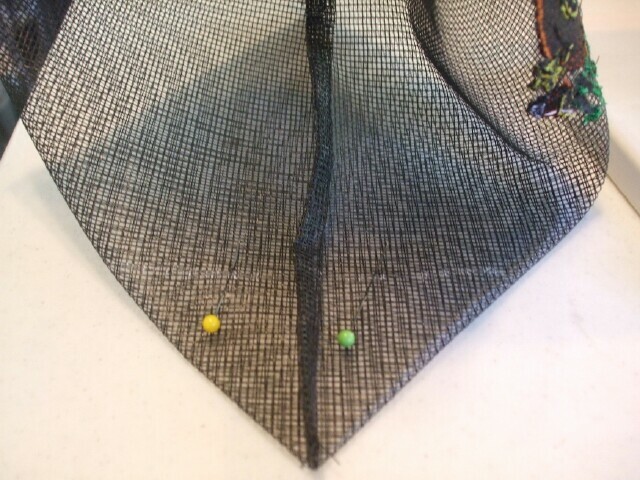 On this size bag, we planned a 4 inch wide bottom. Measure across the triangle finding a 4 inch width. Mark the place with a soap line. Stitch along the line. Repeat on the other side. Then turn the bag right side out. The work is done and the fun begins. 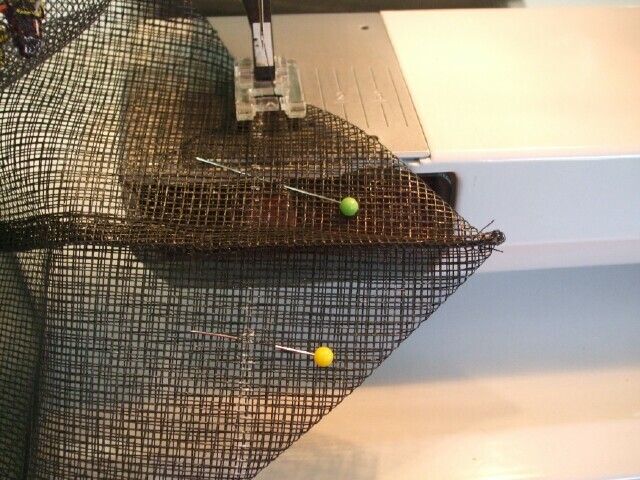 Turn 1/2 to 1 inch of the top edge of the bag to the outside and finger press. The amount you turn down depends on the width of the ribbon you plan to use. Turning it to the outside allows the ribbon trim to cover the raw top edge. Make a handle for the bag. I used two different colors of ribbon back to back top stitched down both sides of the ribbon. You can make the handle the length you prefer. Mine was 17 inches long. Center the ends of the handle on the side seams far enough down so that it will be stitched into place with the decorative trim around the top of the bag. Pin into place. 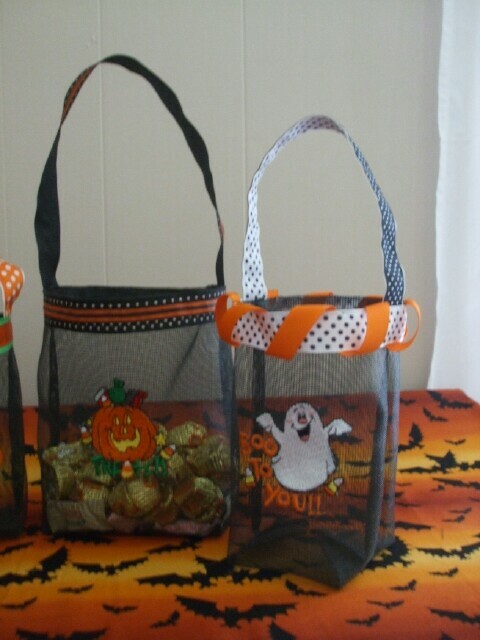 Use your favorite Halloween ribbon and top stitch both sides of the ribbon to the top of the bag. Add bows, decorative buttons, or any other trim you like. These are mine!! 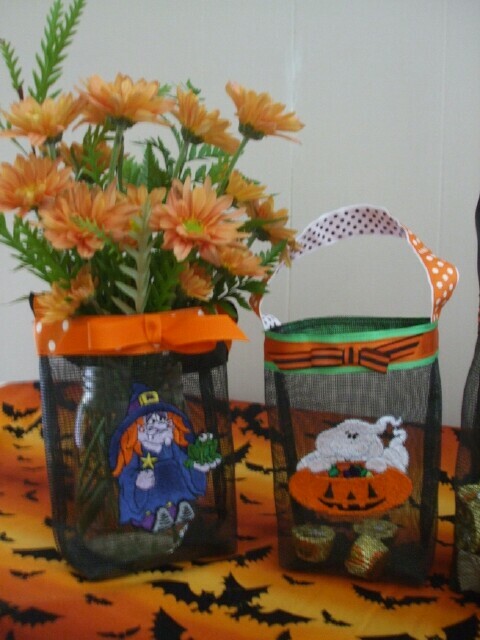 If you don’t have any little ones to trick or treat, they make great decorations for Halloween or with other embroidered designs for Thanksgiving or Christmas. I used one on my desk last year to hold candy canes during the holiday season. Thanks for reading my blog. Virginia. Thank you for taking the time to share your projects with us! It's always fun to see new items. Very clever! Thanks so much. I have made bags like these but lined them with cotton and added pockets but now I will try them with out lining and would they not make a great beach bag. These little bags are so cute. I have some of this screening in my sewing room. Got it several years ago when I thought I would make a vest using it. I might still make a vest but do machine embroidery on it too. Thank you so much. Does anyone know if you can use fiberglass screen? I have not been able to find plain vinyl screen. I have found some called "pet screen" but it is heavy. This is only a test. . . . Embroidery Advisor Presents: A King Who Loved His Embroidery?